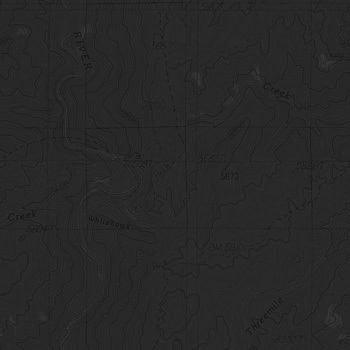 Originally conceived as a solo ride, I began planning a trip into the Oregon Owyhees with aerial views, squinting at faint, pixelated lines hoping to distinguish motorcycle from game and cattle trails. Although Michael is amenable to the “adventure” that comes with these guesswork routes, I sought additional validation from Owyhee expert Ed “trailrider383,”² EveryTrail¹ and other sources when it became a trip for two. The little hippo has proved dependable but that unmentioned autumn mishap eroded my trailer trust so I added some short racks and pulled the hubs to check and repack the bearings. All was well. And of course I would do as the rim stickers warn and not exceed 55 MPH. Always obey stickers. Although our devices gave us both questionable arrival estimates, Michael and I manage to be at the first Succor Creek Road pullout at the planned time. We suit up and ride the short distance to Fisherman Road and head west across momentarilyi green hills. They are careless whether they be seen, or praised. Diverse minerals and histories paint the Owyhee River watershed white, green, orange and red. Michael and I stop to gaze a moment at the prismed topography spread before us. I thought a round hill aside the pale tracks of our route might afford a view of the Owyhee Reservoir, a view I’ve enjoyed before,¹ but instead we find ourselves surrounded by the same earthen ocean rolling to each horizon. I describe for Michael the late model truck we found smashed¹ at the bottom of a cliff on a ride led by “Special” Ed² a few years ago. We learned it was from the suicide attempt of one Ted Kestner after he’d murdered his landlady. “I wonder how they got it out,” Michael says, thinking out loud. I hadn’t planned to go down that far but after talking about it, I’m curious too. Someone has propped up a homemade stop sign in advance of the cliff. I wouldn’t be surprised if it’s saved a life. There’s little doubt that speeding past would be fatal. The truck and scattered debris are completely gone. We walk around the rocks a minute enjoying the breeze and view to the reservoir before resuming our trek south. If you’ve ridden with Michael you know he is meticulous and a skilled and dedicated rider. So I was excited to learn he’s started applying his professional experience to the riding community with the introduction of durable, stylish bags. Check out OBR ADV Gear: facebook.com/OBRADVGear. There seem to be three road use classifications in the Owyhees: prohibited, limited to designated routes and limited to existing routes. Sometimes there are distinguishing markers but often you can only hope you’re doing the right thing. We have climbed back above the Owyhee River watershed and are riding rapidly south along the Honeycombs Wilderness Study Area. “They didn’t work too hard on that name,” Michael remarks as he checks the view. The Oregon Desert Trail,¹ especially the canyonlands we’re riding today, was rated by Outside Magazine as the second “Best Desert Trip” after Namibia.² To some, “best desert trip” is an oxymoron or at least a very low bar. But today, as golden grasses bend in a cool breeze and pastel flowers dot ephemeral meadows embraced in the brilliant hues of the infernos that formed this land, it is hard to disagree. So expansive and so striking, these vistas take my breath away. The honeycomb (called tafoni) and other whimsically shaped outcrops around the Owyhees have been mysterious to me. How did they form? Obviously “devitrified material is more resistant than the dense glassy rhyolite and erosion of glass leads to a honeycomb-like texture in weathered outcrops”¹ but I can’t visualize the process. I guess that’s okay. Some mystery is good for the mind, good for perspective, I think, when not used to justify belief in faeries and daemons. We ride south from our break at the top of Carlton Canyon past Long Gulch toward Three Fingers Gulch. Expansive basins ringed with orange outcrops evoke the ochre palaces of Charn, larger and more ancient than imaginable. I follow the orange line of the GPS, and Michael follows me, down from the hills to lesser tracks along the length of Shadscale Flat. Here cows graze with their calves, watching us dumbly, as we pass intermittent clouds of flies, the first insects I’ve seen today. I checked with Michael before we rode about doing a little hiking. It sounded good to him. The road ends just as you enter the gulch. Michael has changed into shoes and we are walking to check out the rock fences visible from where we parked. The rock corral in the bottom of the gorge makes sense but we can’t figure out the partial walls we’ve noticed above on the steep talus at the base of the cliff. We climb to investigate. It is Michael who has the revelation (or maybe he knew all along) that these ancillary walls weren’t meant to contain but to direct the wild horses to the coral below. Once he says it, it seems obvious. Many of the wall’s rocks are the size of two or three basketballs. It would be strenuous for even a strong man to move them. We are impressed by the work that went into making these walls. Michael notes our tendency to romanticize these free-spirited cowboys but from here it doesn’t seem so enviable. We return to our motorcycles for a quick drink then continue the opposite direction down the gorge. The walls here are so high, so vertical, they seems to tip toward us, to loom over us. Ahead we see an ebony entrance into rock darker than the vertical orange mass above. Inside is a living room-sized space coated in the thick soot of many campfires, some likely those of our rock-hauling wranglers, weary of a hard day in the desert sun. “I don’t see any dates,” Michael notes. Pockmarks in the soot-lined walls reveal something like an underlying layer of chalk. It’s easy to leave a mark, as many have. Michael and I continue walking down the gorge toward the Owyhee Reservoir. Sometimes there’s a trail, sometimes just the rocks of the mostly dry creek bed, but always high walls dictating our direction. We discuss for a time our wives’ ambitions in the context of the corporate bureaucracies they’ve experienced — the dictated directions. My wife was brave to set off in her own direction a couple years ago¹ and hasn’t looked back. In a spot half-surrounded by boulders, I suggest “this would be a great spot to have a fire at night and watch the stars.” I imagine crackling fire and rock faces like sapphire in the dancing light. “I think the best way is to walk along there,” Michael advises from the bottom of the dry fall he’s skidded into, pointing at the descending intersection between 45 and 90 degree rock walls. I thought we would reach the reservoir (we only had to walk an inch on the map) but the dry winter has put sight of it beyond “one more bend” too many. We call it good and head back. Approaching the dry falls again, I think the contrasting rocks are primeval colossi that grappled and ground themselves into a perpetual embrace, a geological yin-yang resolved in this quiescent stream. Back at our motorcycles, we each take long drinks before beginning the last leg of our loop. The breeze feels good. The KTM abruptly changes its tone as we’re speeding along Shadscale Flat and I know something has gone wrong. We quickly find it’s a minor thing, the slip-on having come loose from the header pipe, but I don’t have the allen wrench to fit the aftermarket bolts. Luckily, Michael does. In a few minutes, we’re good to go. Thanks Michael. Back among rolling hills above the watershed, we speed from gate to gate, turn to turn, a hard-to-follow maze without the line of the GPS. The occasional ruts and rocks of long stretches demand complete attention at speed. I kind of imagine I’m running the Dakar, flying over hazardous terrain at ridiculous speeds (for the wife I emphasize “imagine”). It’s a lot of fun. In one long draw we become honorary antelope as we converge with a herd that runs parallel to our route for some distance. We turn temporarily from our loop to climb to the base of Three Fingers Butte. “That was rocky,” Michael remarks in that experienced rider tone equally applicable to seeing a pretty butterfly or nearly slipping off a cliff. “Yep,” I answer in kind. The wind is stiff, almost cold. From here we can see out across the Snake River Plain to the high mountains we’ll ride in coming months. Back on our main route, we notice an intriguing outcrop at the head of a small meadow. “We have to check it out,” Michael says, as if stating the obvious. We step through a gap into one of those myriad, magical Owyhee spaces that leaves us curious to know its history, ancient and modern. “We’re in Succor Creek State Park now,” I tell Michael after we’ve ridden some miles from the gap in the rock. We’re within its boundaries but we won’t see its facilities until we finish descending. “Jessica and I rode up this way on the GS once,” I mention, “but it got too rough so we turned around.”¹ It’s much easier today. Once on the wide gravel of Succor Creek Road, we stop to look across the park then head a speedy thirteen miles to where we parked this morning. The whole day has gone smoothly. Without mishaps and misdirections I’m not even sure what I’ll say about it.